Sometimes people wonder how Donald Trump, the loudmouth business man who succeeded to offend almost everyone, Mexicans, politicians, foreigners, Muslims, succeeded to become the leading candidate of the Republican party for President of the United States. My explanation: It has to do with the theory of lifecycles. Every system has a lifecycle. Corporations do (See Ichak K. Adizes: Managing Corporate Lifecycles Santa Barbara: Adizes Institute Publications, 1999.) People and trees do. Countries do too. They are born, grow, age and die. Where is USA on the lifecycle? I believe that it is at the beginning of the aging stage. It moved from GoGo to Adolescence during the depression era, that is when the Administrator (A) role was introduced with the New Deal, and Keynesian economics legitimized government intervention in economic affairs. What was functional then, to transform us into Prime, became a burden that is aging us now. The USA, in my opinion, was in Prime after the Second World War and during the 1950s. From then on it has been starting to "age." As a system starts to age, it starts to fall apart, to disintegrate. In the USA we are witnessing an increasingly unprecedented confrontational behavior between Republicans and Democrats and an increased level of social violence. It is even noticeable in the behavior of the business community. In a January 24, 2016 New York Times Magazine article entitled Why Are Corporations Hoarding Millions, economists report that corporations are accumulating cash in unprecedented quantities. They have no explanation for this behavior. I suggest that it is the result of the aging of the system. Large companies become more risk averse as they age. Systems require different leadership styles depending on where they are on the lifecycle. Disintegration, which is a manifestation of aging, calls for integration, for the Integrator (I) role. That explains to me the rise of Obama to the presidency. When I analyzed his first inaugural speech (in my January 30, 2009 blog) the content analysis show he was an (I). His subsequent behavior and leadership style support this analysis. He prefers diplomacy to confrontation; community building (he was a community organizer prior to entering politics) and compromise instead of war. 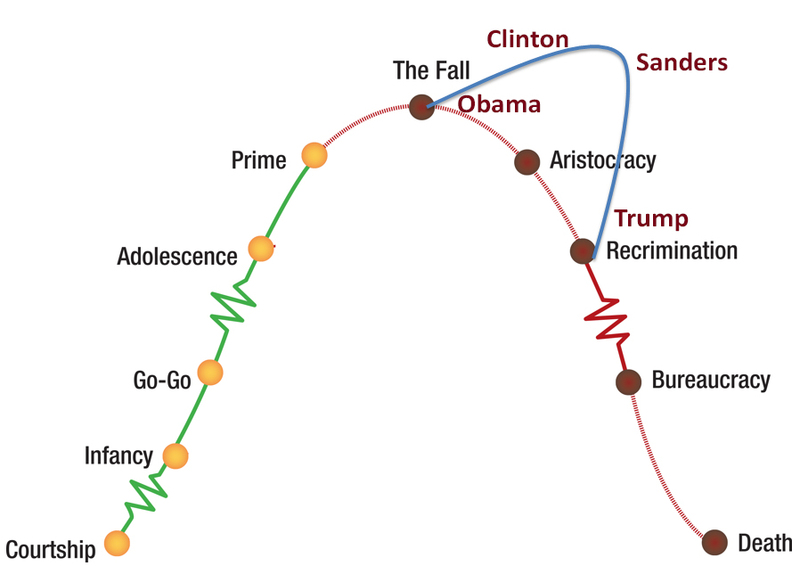 The location on the lifecycle the USA is in calls for (A) and (I) because we are further down the lifecycle from the time Obama took residence in the White House. Thus, guess who is coming to the podium and considered for leadership? Study Bernie Sanders' agenda. It is (I), socialism, though government intervention, (A). And he calls for political revolution. That is the Entrepreneur (E) for you, a remnant of the glory days when America was still young and with vigor to even consider revolution. I see her as a Producer/Entrepreneur (PE) combination. She has a vision. And she loves action. Her (PE) style makes her subject to criticism that she is not honest. It should be expected from such a style. I suggest a (PE) style and agenda fit better where the USA is coming from on the lifecycle. Not where it is sliding into. Not strange Hillary Clinton refers repetitively to the past, as something to look up to, especially the time her husband was the president. He clearly has no (I). The expression he is famous for is: "You are fired." He offers no vision. His solution to immigration is to deport all illegals. Millions of them. How? No details are offered. What about the terrorist problem? Close the borders to all Muslims. How about ISIS? Bomb them to oblivion. No (A). No explanation how he will go about executing his plans. No (I); he does not need anyone; he can do it all by himself. Trust me, he says. No (E), no big vision. When asked details on how America will be successful again, the answer is: watch me do it. A (P), (P), and more (P) style. Why is he attractive then? Because his style is called by the stage of Recrimination on the lifecycle. All (P). He is 180 degrees opposite of Obama's (I) style. The Republicans are sick and tired of the wishy-washiness of Obama's leadership style, his (I) behavior of leading from behind. They are looking for someone who will take the bull by the horns, who will clean up the stables, never mind how. (P)!!!! Sanders claims he will clean the stables too but provides the how he will do it. He calls for a political revolution, (E). Trump gives no explanation, no vision, no plans. No how. If we place the leadership styles of Obama, Clinton, Sanders and Trump along the lifecycle, I suggest the following leadership styles fit well with the following location on the lifecycle: Obama: late Stable. Clinton: at Early Aristocracy. Sanders at late Aristocracy and Trump for the beginning of Recrimination. What about the other contenders, Rubio, Christie, Cruz and Jeb Bush? Rubio and Christie's styles and agendas are not distinctive enough to classify in PAEI terms. They are not as attractive as the clear (P) style of Trump or the (AI) style of Sanders. Cruz is less (P) and more (E). His (P) style makes him attractive like Trump but since his (P) is lower, balanced with some (E) he is less attractive than Trump. Bush is trailing because he comes across as another (I); his style resembles Obama too much. The USA departed from the location on the lifecycle where that style was considered attractive eight years ago. What about Bloomberg, if he chooses to run? I believe he is a (PE). If he gets elected, I suggest, it is because his style is less extreme than Sanders' or Trump's. His style is similar to Clinton's, but not being a real politician, he is less tarnished and more trusted. One of the symptoms of aging is people's resentment of their leadership. People attribute the aging problems to the failure of the leaders. At present all politicians are less popular then ever. This is another reason why Trump is attractive and why Bloomberg will be as well. Just daring to think, and say it.